Set on some of the Caribbean's best white-sand beaches, your luxurious accommodations showcase stunning ocean and beach views from the seclusion of your private balcony or patio. These over-sized balconies and patios feature comfortable lounge chairs and a stylish dining area overlooking pristine turquoise waters where you can enjoy an intimate dinner for two or gather the whole family for a delicious breakfast. Our Butler Elite provides guests staying in top-tier suites with flawless personalized attention. Trained in accordance to exacting standards by the Guild of Professional English Butlers, your personal butler delivers a supreme level of service where your every need is anticipated. From VIP check-ins and private parties to an exclusive Concierge Lounge, free Wi–Fi, and fully-stocked in-room bars, every detail has been thought of to create the ultimate Luxury Included® vacation. 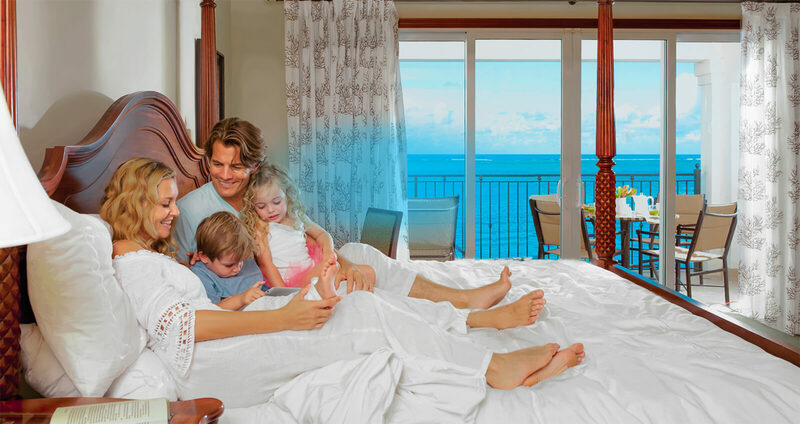 Beyond the traditional concept of rest and relaxation, all of Sandals Tranquility Blissful Beds™ feature premium king-size mattresses complemented by fine Egyptian cotton linens and a pillow menu with hypoallergenic and feather down pillow choices – all to ensure you get a good night's rest.